A week ago, we looked at the difference between two types of silk gimp – the new silk gimp from Access Commodities and the silk gimp from Pipers Silks. 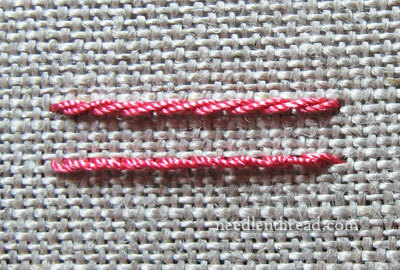 These are two completely different types of silk thread that share the same name. So what is gimp, anyway? Gimp, in textile talk, is often a trim of some sort. If you look up “gimp trim” for sale today, you’ll generally find narrow individual cords or flat ribbon-like trim with a cord that runs through it in a decorative way. In lace-making, gimp is the trim that outlines a lace element, and it can be tube-like looking (not actually a tube, but a smooth cording) or twisted, with a fine rope-like look. Gimp often has some sort of core running through it that helps “stiffen” it in a way. The core is wrapped or twisted with an outer thread. Sometimes (in the more heavy duty gimps), the core is a flexible wire, so that the gimp retains its shape when bent and manipulated. Sometimes, the core is another thread or cord. And some gimps are not made with a core. So we can see that gimp in thread talk, when taken generally, can mean different things. The silk gimp from Pipers Silks is sold for lace making, but because of its structure, it can actually be used for silk embroidery thread, and it works well this way for regular surface embroidery. In the photo above, I’m using Pipers “twisted gloss silk gimp” (G73) in orange heather, to fiddle around a bit. Because it reminds me of autumn leaves, I tried a few leaf shapes with it. The large one on the right is made with a twisted chain stitch, surrounded by fly stitches down the shape of the leaf, and the others are detached chain stitch. This stuff works pretty much like any twisted embroidery thread. Because it is a filament silk, it is a z-twisted thread, though, and this fact does make a difference in the way certain stitches come out. In the photo above, the two lines illustrate this point. 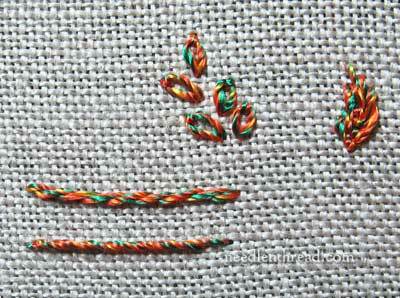 The top line, which looks like stem stitch, is actually outline stitch. 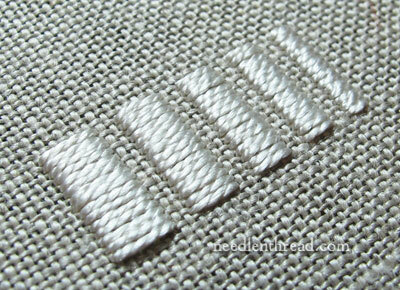 The lower line, which looks like outline stitch, is actually stem stitch. 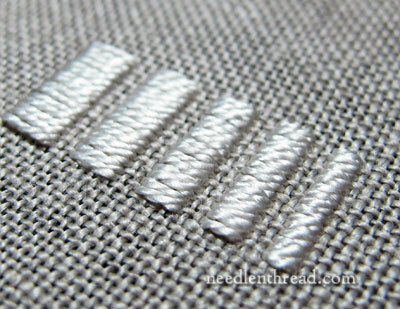 If you’re unfamiliar with the z-twist / s-twist difference in embroidery threads, there are a few articles here on Needle ‘n Thread that can clarify the subject for you. Essentially, all filament silk embroidery threads and rayon embroidery threads are z-twisted, and spun silk and cotton threads are s-twisted. You can read about the differences between s-twisted and z-twisted threads here, and you can see these differences in stitched samples here. This is the 90/9 silk gimp in strawberry. It’s listed as “thick silk gimp,” but in fact, if you’re considering it as an embroidery thread, it’s a fairly fine thread. It’s a bit finer than a typical silk buttonhole twist. It handles a bit like silk buttonhole twist, but without being quite as boingy. I’d put it around the size of a #12 perle cotton, for the sake of comparison. Pretty much, you’re looking at a tightly twisted filament silk thread that can be used for embroidery. My guess is that crazy quilters would really like this thread. At Pipers, it’s sold as a lace gimp and for tatting. Again, all of these threads are z-twisted, so the top line of stitching there is outline stitch, and the lower line is stem stitch. Notice how the individual stitches in the lower line are not as discernible from each other, while the stitches in the top line are? 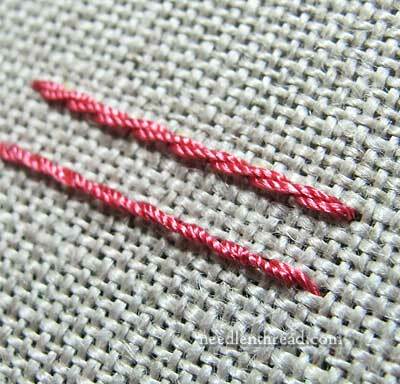 That’s the difference in the look between outline stitch and stem stitch, but in this case, because of the twist of the thread, the outcome is actually reversed. This is the “very thick gimp” (15/2) from Pipers silks. It makes a really nice, smooth satin stitch. It’s definitely a fatter thread, and it’s a much softer thread than the other gimps I tried. It has a much looser twist. This is listed for lace making and tatting as well. I’m not too well-versed in tatting, but I can’t imagine tatting with a thread that’s quite this soft. 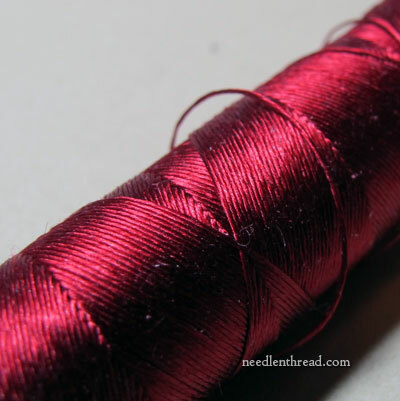 It’s a nice thread for embroidery – it reminds me of the looser twisted filament silks I’ve seen on vestments of old. But it’s only available in white! It also reminds me a bit of Trebizond silk thread, but Trebizond is made from three plies, and this is made from only two. I’d compare this thread to somewhere between a #5 and #8 perle cotton. I haven’t played yet with this silk gimp – but I will. It is the thread that intrigues me the most. It’s made from several plies of filament silk, in a very long, gradual twist that makes it look like a flat silk. The overall thread has a bit more stiffness to it than regular filament silk or flat silk, so I’m eager to see what it can do. I’ll try it out and show you later on! Conclusions: The silk gimps from Pipers Silks can be used for hand embroidery. There’s no reason why they can’t be – they are basically twisted filament silk threads. Some of the gimps come in a limited range of colors, and some only come in white, black, or ecru. But if you want to try them out for your embroidery endeavors, take a look at them! I enjoyed stitching with them. Thanks for your article on Gimp silk threads. I recently bought a deep blue colour Gimp silk thread from Pipers and I was wondering what to use it for, I can now use it as part of a project I will be starting soon it’s going to be a guardian Angel so I can use it to embroider the gown on the Angel. I really appreciate you sharing your experiments on this thread with us, thanks. Anything that clarifies Pipers Silk thread is a bonus. Thank you so much for this Mary. I have known about them for many years and have tried to explain what it is I need, but found inveriably that they have little knowledge about the application of there thread. I have had samples from them on more than one occasion, but the size thread has always been much to fine for the silk gauze I was using, so have gone elsewhere. 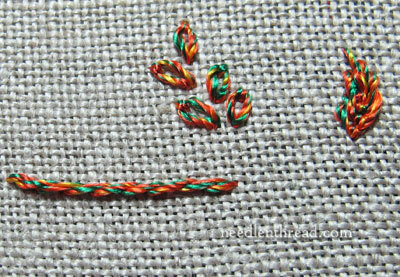 Generally I like to use a single thread and would go to a larger size rather than doubling the thread. Hello Mary, Greetings from India!! I have been a fan follower of your blog…for patterns and ideas. Though am not a pro with stitching I enjoy watching the videos, reading the posts…..hope to try these sometime. I enjoy working with long stitch designs, like the once we get in the “ready to make kits”. In India we are all fond of “Anchor Stitch kits”, I don’t know what these stitches are called. Am looking at some designs/patterns to make for my baby girl’s nursery…..could you please help me with some patterns that I could readily use. It will be strictly for my personal use….no commercial use at all. Hi Mary, Just wondering, is it possible to divide these these Piper´s silk gimp threads into various strands? Or does the fact that they are filament threads mean that they are not to be divided? Thanks for all your posts by the way. I´m such a huge fan!!! Because the threads are twisted, if you separate the plies, they’ll be quite wavy. However, you can stitch with them. Because it’s filament silk, it is strong and it won’t shred (like cotton would, if you tried to separate a non-divisible thread). So it is possible, but the resulting thread will be a very wavy thread. It’s nice for some techniques, though – kind of interesting – and with some coaxing (for example, you could run them through the steam spout from a boiling kettle and then stretch them and straighten them) you can eliminate at least some of the wave from the separated threads. I´m going to buy some of their threads and try them out. Previous Previous post: Testing Embroidery Threads: Colorfast?